A large crowd attended last Thursday’s concert featuring Bob McCloskey and the rest of the JP Jazz Collective, and enjoyed their cool renderings of blue note jazz. The HP Friends’ Summer Concerts in the Garden series is at its halfway mark, so don’t miss out on the rest of the concerts! Tanya Maggi and David Russell performing Classical string pieces on viola and cello on August 25. In case of inclement weather or extreme heat, performances will be offered indoors in the branch library’s Menino Hall. We look forward to seeing you in August! Ralph Rosen returns to the Hyde Park Branch Library on Thursday, July 21, for the third in this summer’s Concerts in the Garden Series. Ralph had organized the trio that provided background and dance music at the Bookmark Ball in April. On Thursday at 6:30, he will be joined by pianist Hey Rim Jeon for a program entitled Eclectic Harmonica Music. Both Ralph and Hey Rim are on the staff at Berklee College of Music. Ralph, who will play harmonica, manages the Media Center and the Library there and conducts clinics, while Hey Rim is a professor specializing in harmony and piano. Both have performed extensively throughout New York and New England, and Hey Rim has also played in Japan and Korea. Each is also featured on multiple recordings. Bring your friends to enjoy their music at this free concert from 6:30 to 7:30. Cool drinks and light refreshments will also be provided. Attendees enjo yed a wonderful concert by Hyde Park resident Daniel Ian Smith and a Collective Directive yesterday. Daniel introduced the band’s Jazz and Latin Jazz renditions with interesting history and information on each piece, as well as a commemoration of a dear Hyde Park neighbor who passed away recently. Pr ior to the concert, the 30th Anniversary of the Friends was celebrated with a beautiful cake from Hyde Park’s own The Pastry Chef. Attendees included 2 of the group’s founders, John Thomson and Bob Smith, as well as a number of Friends Board members past and present. Friends President Kathy Adams and former Branch Librarian Barbara Wicker spoke briefly about the history of the Hyde Park Friends. 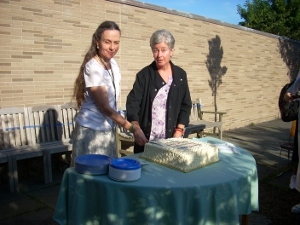 Barbara and current Branch Librarian Mary Margaret Pitts cut the cake, and Friends members distributed pieces to all attendees as the music commenced. Councilman Rob Consalvo arrived and thanked the audience for its support of the Friends and the branch library. In Concert: Daniel Ian Smith and a Collective Directive Celebrate the Friends’ 30th Anniversary on July 14 at 6 p.m.
Garden festivities begin early on Thursday, July 14, as the Friends of the Hyde Park Branch celebrate 30 years service to the Library with an anniversary cake (made by Hyde Park’s The Pastry Chef) followed by a concert by Daniel Ian Smith and a Collective Directive. Mayor Menino and Councilman Consalvo expect to attend. Jazz and Latin jazz will be the featured music for the evening. Daniel says that he views jazz as a communal experience with the combo members contributing original pieces. His instruments include all saxophones and flutes. A professor at Berklee for 17 years, he has also played and taught in Mexico and Japan. In addition, he ran the Brookline programs Jazz in the Sanctuary for 10 years. His extensive discography includes recordings made by his 12 year old group, the New World Jazz Composers Octet. Playing acoustic bass will be Keala Kaumeheiwa, an original member of the NWJCO. A graduate of the Thelonious Monk Institute’s first class, he is one of the most sought-after bassists on the Boston music circuit. The pianist will be Berklee professor Gilson Schachnik. A native of Brazil, he has played and recorded extensively and leads the Gilson Schachnik Group. Guitarist John Baboian is a frequent participant in the Capetown Jazz Festival in South Africa. He leads the John Baboian Quartet and the BeBop Guitars, and has composed and arranged for television and radio. Drummer Brooke Sofferman rounds out the Collective Directive for this performance. Much in demand as a sideman, he is also a composer and has made multiple recordings. 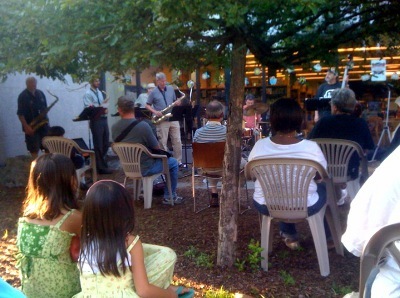 Summer has arrived at last bringing with it the Concerts in the Garden for a sixth season at the Hyde Park Branch Library on Thursday nights in July and August. The series titled “From Hyde Park to Hyde Park: the Gift of Music” features at least one Hyde Park resident in each concert. The free concerts are from 6:30 to 7:30 in the garden (entrance from the Library Children’s Room and from the street); in the event of rain, the performance moves to Menino Hall in the library. A wide range of musical genres are represented in the schedule. Kicking off the season on July 7 will be the HP3 with Jeff Todd playing “funky rock and roll.” During the 8 weeks, you can also enjoy traditional jazz and blues, country folk, harmonica music, acoustic pop rock, the great American songbook, and a classical strings concert. 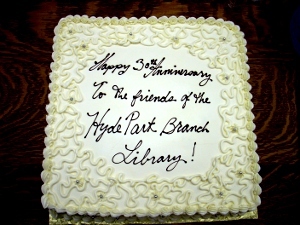 Thursday, July 14 will be a special day as the Friends of the Hyde Park Branch Library, the sponsors of this series, will celebrate its 30th anniversary. The festivities will begin early that night, and Mayor Menino will join us to cut the anniversary cake made by Hyde Park’s The Pastry Chef. The 6:30 concert features Berklee professor and Fairmount Hill resident Daniel Ian Smith and a Collective Directive, a quartet playing jazz and Latin jazz. Free refreshments are available at each concert. The series is sponsored by the Friends of the Hyde Park Branch Library in collaboration with Artists-at-Large and the Boston Public Library. Check out the schedule below and add the garden concerts to your Thursday schedule, July 7 through August 25! Check back here every week for bios of our performers. See you in the Library Garden! Music will be sounding forth all across the city during Boston JazzWeek April 29 through May 8. There’s no place better to enjoy it than at the Hyde Park Library on April 30 when the Ralph Rosen Trio will appear as the Bookmark Band! Leader and Hyde Park resident Ralph Rosen will entertain on both drums and the harmonica. Manager of the Media Center at Berklee, he has performed widely with prominent blues artists such as Bo Diddley and Ronnie Earl, and was featured at a popular concert in our library garden last summer. Rob Christopherson, an associate professor of piano at Berklee and music director for Boston’s Hampshire House, will display his talents as a pianist and vocalist. A passionate teacher, he has recorded with or performed as a sideman for artists such as Phil Wilson, Chuck Berry, and The Platters. Rounding out the trio is bassist Herman Hampton. Also on the Berklee faculty as an associate professor of ensembles, his performing experiences have ranged from symphony orchestras to pit bands, from jazz clubs to salsa orchestras. The music the trio will be performing “is not rock, funk, or punk,” says Ralph. They will be playing straight ahead jazz renditions from the American popular songbook–great songs from the 1930s to the early 1970s. So bring your dancing shoes if you wish or just sit back and enjoy the great music at the Back2Basics Bookmark Ball! 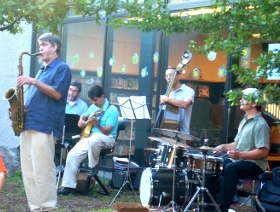 As part of BostonJazz Week, Artists-at-Large, Inc., will be presenting Entourage at the Hyde Park Branch Library on Monday, May 2, 2011, 6:30pm-7:30pm. Entourage is a youth and teen group from the Boston Arts Academy, and will be performing straight-ahead jazz with vocalists from Berklee’s City Music Preparatory Academy, led by Berklee faculty member and Hyde Park resident Sherry Young. This program is being funded by the Friends of the HP Branch. Artists-at-Large, Inc., is committed to bringing art, in all its forms, to Hyde Park and beyond. The Boston Arts Academy (BAA) is the city’s first and only high school for the visual and performing arts, and is located in Boston’s Fenway neighborhood. Berklee College of Music’s City Music Preparatory Academy is a comprehensive music program for kids grades 4-8 that introduces students to both the college experience and Berklee’s City High School Academy.